A highlight of my year is the annual Vocations Retreat. It brings a good dollop of hope to the Diocese. The elderly often accompany the weekend with their fervent prayers. Simply to know that it is happening uplifts everyone, perhaps in the same kind of way we feel when another young family or teenager walks through the Church doors to take up a seat for Mass. Embracing the future with hope is an essential sign that our Christian faith is alive and well. I’m an optimist and so I try to balance my desire for more marriages and more priests, Sisters and Brothers with a tranquillity that arises from trust in the Holy Spirit (Blessed Antonio Rosmini was big on that). Years ago when I was doing my OE, long before I was a priest, I visited a Benedictine Monastery near Rome at Subiaco. Chatting with one of the monks, I asked him how many were in the community. He replied: ‘you would be the fifteenth’. His clever, kind, faith-filled response has brought a smile to my face everyone time I recall it. It embodied a spirit of invitation that comes from Jesus himself: ‘Come follow me’ (Mt 4:19). 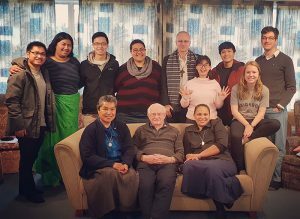 Nine young people joined me – and two Sisters of Compassion, a Marist Father, a diocesan seminarian, and a Rosminian postulant, together with a lay woman presenter – for a weekend of prayer, insight and purpose. The next step for some will involve a letting go of the familiar and an embrace of the partially unknown. Unlike how perhaps some people imagine the life of a priest or Sister or Brother, it is a life of freedom. Ultimately all our formation and training is formation to be free of anything that locks us down or in or out, in order that we might serve without condition. Freedom isn’t the gateway to endless possibilities; it’s the finding of the one possibility which liberates us to be who we truly are called to be. It’s a big call. Just as is marriage. My hope, as I’m sure is also that of Cardinal John, is that more young people will find the level of peace and courage in their hearts to take a further step towards embracing God’s call of self-giving freedom.